One of the best gaming PCs we've tested, with powerful components, easy case access, and plenty of overhead for upgrading, all at a sub-DIY price. While iBuyPower may feel like a new prebuilt manufacturer to many, the company's actually been kicking out gaming rigs since all the way back in 1999. The company's laser focus has always been specifically on the gaming market, and looking back through its history you see a builder that's evolved alongside the subculture. It has teamed with eSports franchises and parts manufacturers to establish itself as one of the premiere builders for consumers looking for value as well as power, and the RDY ELIBG205 feels like the pinnacle of that long road of iteration and growth. The ELIBG205 comes loaded with some top of the line performance parts, focused around its mighty RTX 2080 Ti GPU and Core i9-9900K CPU, enough power to drive modern AAA titles at 4K Ultra at reasonable frame rates. In fact, the majority of games I tested on the system were comfortably around (or even above) that golden 60 FPS mark, and even the most demanding of the current crop of titles, Metro Exodus, delivered a steady 30+. It's the most 4K Ultra ready machine and the best gaming PC I've tested of the RTX crop, and if you've got a display with a ridiculously high refresh rate it'll mercilessly crush QHD games at blazing fast frame rates as well. It's an appealing looking machine, too, especially when its glorious rainbow of RGB lighting is fully in effect. Rings of pulsating light curve around every visible fan, complemented by the glow of the Spectrix RAM and the iBuyPower branded CPU cooler, playing diffuse colored lighting across the matte black case, gunmetal motherboard, and tempered glass front and side panels. It's a beautiful sight that never fails to entrance my kitten or elicit comments from visitors. It's also a breeze to crack open if you decide to add some aftermarket parts or upgrade any of the components. Just slip off the four thumb screws holding the tempered glass side panel in place and you can easily to get to everything on the MAG Z390 Tomahawk mobo, or loosen the two captive screws on the opposite metal panel and you can get at the HDD bay, PSU, and all the nested cables (the sheer volume of which can be limited to essentials thanks to the modular power supply). That HDD bay is one of the few shortcomings of this build. While the motherboard supports up to six simultaneous SATA devices, there's only realistically room in the bay for two 3.5" drives, and no trays to easily remove them or secure them in place (they instead need to be screwed down). While two additional drives may be plenty for most users, it's a disappointment there's not more room paired with a mobo that can support up to six. And you'll likely need to add more storage. 1TB won't last long when you start stuffing the drive with modern games, and it's a SATA SSD rather than the much speedier M.2 NVMe alternative (the board does have space for up to two M.2 drives as well). There are slots on the side of the case itself for a pair of 2.5" SSDs though, which is a nice touch, one of which is filled by the cheap and cheerful WD 1TB Blue that comes with the machine. Those are relatively small gripes, though, and they're easy to forget when you're being dazzled by the ELIBG205's blinding performance. Benching the machine in Total War: Warhammer 2 and Shadow of the Tomb Raider yielded near 60 FPS in each, and I've been running around the barren, junk strewn streets of DC in The Division 2 for around 20 hours and the ELIGB205 has consistently delivered more than 50+ FPS throughout in glorious 4K Ultra. Results were similar in gorgeous new titles like Anthem and Assassin's Creed Odyssey, and even after prolonged sessions the fans never spun up to an intrusively audible level. Only Metro Exodus really challenges the near 60 FPS trend, but even at Extreme quality with ray tracing set to Ultra it stayed mostly above 30. Of a very large field, the ELIBG205 is the only machine I've tested that can reliably push games to 4K Ultra at anywhere near 60 frames per second. The comparably priced Corsair Vengeance 5180, for instance, is lucky to get near 30 frames in the same games, and in highly demanding titles like Metro, 4K Ultra is generally out of reach. While anyone can pack a case with high-end parts to get to these kinds of numbers, the real miracle of the iBuyPower machine is how it does so at prices rivalling contemporary, lower specced PCs. The ELIBG205 doesn't skimp on extras, either. On top of the aforementioned, generous storage ceiling, there's also space on the board for up to 64GB of RAM and three PCIe x16 slots. There's a wealth of USB ports as well, for slot hungry peripherals (including VR headsets) - six on the back of the case and another pair on the top panel. There's also the reassurance of a three year warranty, and even a three game bundle with which to test your new system (Anthem, Battlefield 5, and Metro Exodus). iBuyPower even throws in one of their proprietary keyboards and a mouse, and while they're not the best gaming keyboard or best gaming mouse available, they'll tide you over until you upgrade. The suite of RGB lighting is impressive as well, and can be modified to suit whatever scheme best delights your senses, both static and dynamic. 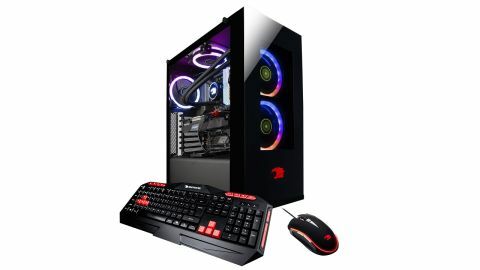 The case is well ventilated and loaded with fans, and the CPU is water cooled, the result of which is that even running at load for long periods of time temperatures never spiked to dangerous levels, nor did the fans spin up to the deafening levels of some similar pre-builts. A resounding yes. If you're in the market for a high-end gaming PC, the RDY ELIBG205 is a very easy recommend. While most pre-builts come with a hefty mark-up tacked onto their DIY price for all the labor they spare you, warranty coverage, and the proprietary parts they often ship with, the ELIBG205 actually ends up with a price tag between $200 or $300 lower than what it would cost to assemble it yourself, at normal retail prices. It's a thoughtfully constructed, great looking, high performance beast that not only exhibits mighty performance out of the box but has a high ceiling to accommodate future additions.